Somehow lost my TSM.... need to know basically which wires need to be coming off the panel (I see tons of terminals and only four are being used, in addition to a very large connector that takes up most of the bottom row), and which fuses go where. I had a tiny fuse in whichever spot is in charge of taillights that was blown, so I pulled one of the medium-sized ones off of an unknown source on the panel and stuck it in and voila, taillights. Is that fuse supposed to be tiny or should it match the rest of them (except for the large one)? Hope my question is understood, I'm sure a shot of that page of the TSM will tell me a lot. I have a 68 manual and will scan and post the 68 panel diagram for your. Not sure if the 69 was the same or not but for sure there were differences in the gauges and the routing of the wiring under the hood. The above is from Eddie's Planet Houston AMX website. 69 uses a few different size fuses for the same circuits when compared to 68. There is probably a pic in the owners manual of the panel with labeling. 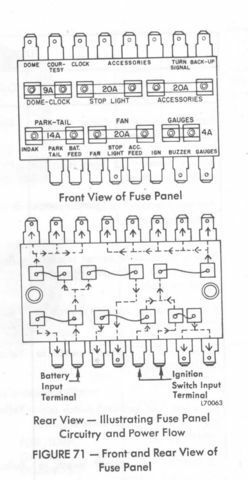 The panel is imprinted with what each fuse location is for and the fuse rating that goes there. The spades are also labeled as to what should plug in there. Is the above pic for a 68??? It does not match what I have. That's the one from the Planet Houston AMX site. I haven't ventured out to the garage yet to get the 68 manual and scan directly from it. I can try and get a scan of the wiring diagram in my 68 Javelin/Amx manual, but probably won't be till tonight/tomorrow morning.. If you'll still need it. I think I'm alright now, actually, after just playing a guessing game with the fuses. Everything works now so we'll see if they continue working. 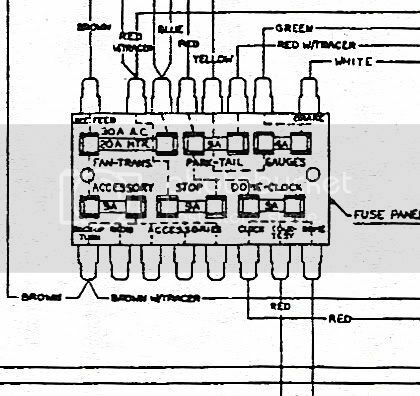 Here is the best I could get it to copy from the TSM, had to play around with zoom to make stuff viewable lol (unless you'd like the whole wiring diagram).